A regular student since the start of 2016, Georgia tells us how Tempo Pilates fits around her schedule, the results the reformer pilates classes have given her and her London go-tos. I joined Tempo about a year and a half ago – I was looking for a studio near work that did great classes. The X-Press class is amazing as it is 45mins long but still very intensive and can be done all within lunchtime during work. So there are no excuses not to workout daily. I go to Tempo Pilates 4-5 times a week, Monday – Friday. 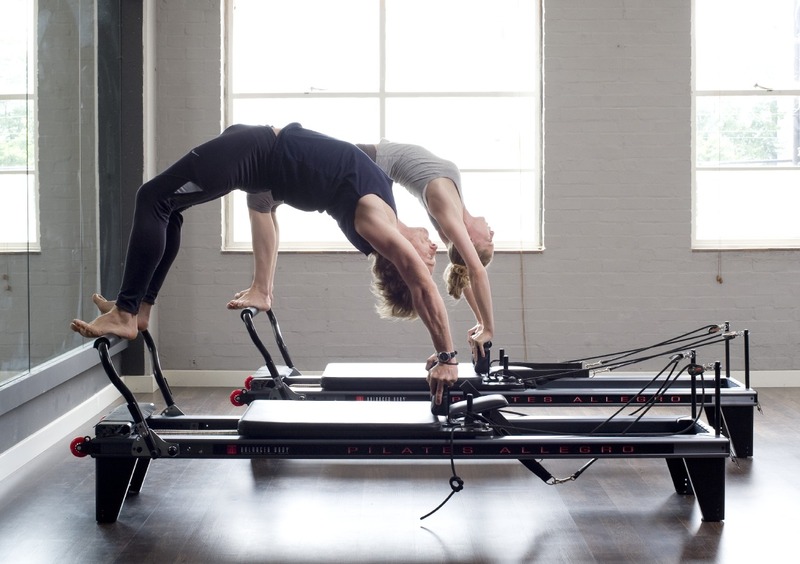 I got into Pilates from my mother, however finding a good reformer pilates studio was tricky – that was until I found the Gymbox Covent Garden studio. My favourite is the X-Press class. Within 45 minutes you work out your entire body – build up a sweat, whilst listening to great music. The routines and positions constantly change so you are always challenging your body and pushing yourself, making each class exciting. For me, it is the only workout where you see true results – muscles are defined without bulking and you really see your strength improve. “Never love anybody who treats you like you’re ordinary” – Oscar Wilde. What is your favourite playlist Tune? Best Fake Smile – James Bay, such an uplifting song. What’s a great film/exhibition/show you’ve seen recently? I recently saw Ink at the Duke of York Theatre – literally opposite the Gymbox | Covent Garden studio. This show tells the story of the birth of The Sun. Highly recommend it. When he’s not jet-setting off to South America, the friendly Toby can be found teaching his fun yet challenging Tempo Pilates classes at our E8 | Hackney and E1 | Shoreditch studios. We spoke to him about his best exercise tips, the improvements he’s noticed since beginning Reformer Pilates and his favourite things to do in his spare time. TP: Tell us about the greatest difference you have noticed in yourself since practising the Pilates method. Toby: I used to suffer from really bad sciatica. Since using the Pilates method, touch wood, I have had no problems. Single leg and double leg bridging have really helped my lower back and glute strengthening. TP: What do you find to be the most challenging exercises on the reformer? TP: Many of us are planning on escaping the London cold for the holiday break. What’s your favourite destination? Toby: It has to be Brazil, a beautiful & gorgeous country. It’s a big melting pot of many cultures. The food is amazing, there’s a big Japanese influence. We like to go to Sao Paolo and to the beach house in Santos and swim in the Atlantic every day- looking for sharks! (laughs). Rio is a bit too touristy. TP: Do you have any Pilates equipment that you would recommend to take along? Toby: I always take a workout mat wherever I go. I love doing leg extensions and planks- on holiday but we always go to beach places so I tend to stay away from these and like to swim/run/jog for some variety. TP: Many of us come to Pilates to reach our exercise goals, especially in winter when we are less active. What are your best tips to help? Toby: Winter time is always hard to motivate ourselves. Keep going. Don’t change your workout routine. Eat well. Sleep well. Don’t overdo it. Rest is just as important. Toby: I just discovered Aviary Hill park and aviary house are very beautiful- they have the second biggest glass house after Kew. Just on the edge of Greenwich. TP: What are your top 5 foods for good health and energy? Toby: Milk. Apples. Quorn. Oysters. Wine. TP: And on the contrary, what are your top 5 foods to avoid? Toby: Cake. Cheap chocolate. Fizzy drinks. Sweet breakfast cereals. McDonald’s. TP: The name of someone on Instagram who inspires you? Toby: Never let the truth get in the way of a good story……..
Toby’s classes run on Monday mornings in WC2; Tuesday mornings in E1; and Wednesday and Friday mornings, and Sundays in E8. A regular at our WC2 | Covent Garden studio, Lida has been coming to Tempo Pilates for over 5 years. Here she shares her thoughts on the results she has seen, her local restaurant recommendations and more. 2010/2011. I was intrigued by reformer pilates. I am more flexible and have more energy! I definitely start my day in a better mood. How many times a week do you attend? That the exercises are challenging but enjoyable! The changes I notice in the way I look and feel. TY Cafe and Barrafina! Great for brunch and a fun dinner. Well done to Lida from Gina and the TP team. Oxfordshire-born Sarah has been a Tempo instructor for 2 years. An experienced dancer and lover of music and theatre, Sarah’s passion for movement really shines through in her classes. This month we spoke to her about nutrition, at-home exercise, personal training and much more. TP: What makes Tempo Pilates different from other Pilates studios out there? Sarah: The music! We have great playlists that really help to motivate both students and instructors. It gives our Pilates sessions a fun edge and helps to give you an extra buzz so that you keep pushing through a tough exercise series. TP: What role does nutrition play in seeing good results from physical exercise, and what foods do you recommend? Before exercise, I eat something light for energy. It can be as simple as a banana, or avocado on toast. Anything heavier and exercises like the 100s feel horrible! My favourite food is peanut butter, in any form, so right now I love peanut butter protein balls. They’re easy to make, and a great ‘on the go’ refuel. TP: What’s a myth you’ve heard about Pilates that you’d like to debunk? Sarah: That Pilates is going to bulk out your muscles – that’s not true! The great thing about Pilates is that it does two things in tandem: it lengthens and strengthens your muscles. It has nothing to do with ‘bulk’. TP: Which area of the body generally needs the most work when a student is new to Pilates? Sarah: The most obvious answer is probably core strength! What new students don’t often realise is that we aren’t just strengthening abdominals during planks and curl-ups. Your core is always being engaged throughout a session, whether it’s simply remembering to connect with your core during your exhale, or engaging your abdominals to help keep your balance for standing work. Basically if you stick with Tempo Pilates you should find that your core strengthens quickly! TP: What Pilates equipment can you recommend to complement at-home exercise? Sarah: The Pilates circle of course! You’ll already know a good few exercises from our Tempo classes that you can incorporate into your home workout. TP: Do you have any favourite clothing/accessory brands that are good for practising Pilates in particular? Sarah: So many to choose from, but personally Lululemon is a guaranteed win – the quality is great and they tailor some of their range specifically for Pilates/Yoga. TP: What are the benefits of personal training at Tempo? Sarah: Personal training gives you the chance to work closely with your instructor and really tailor each session so that you focus on your own personal goals. A lot of my students find that personal training complements attending group classes. Personal sessions enable you to consolidate and develop your technique; the sessions can be tailored more effectively to support your particular body type and can more fully accommodate your personal goals. TP: The last good film you’ve enjoyed recently? Sarah: I love watching films. Hard to pick just one, but recently I watched Ex Machina, which I really enjoyed; it had me on the edge of my sofa with the suspense, the special effects were incredible and it I found that it gave me lots to think about afterwards. I would definitely recommend it. TP: A song from our current playlist that you enjoy the most? Sarah: James Brown – I Feel Good. The catchy beat really motivates you with the footwork series. Sarah’s classes run regularly at our E1 | Shoreditch and WC2 | Gymbox reformer pilates studios.